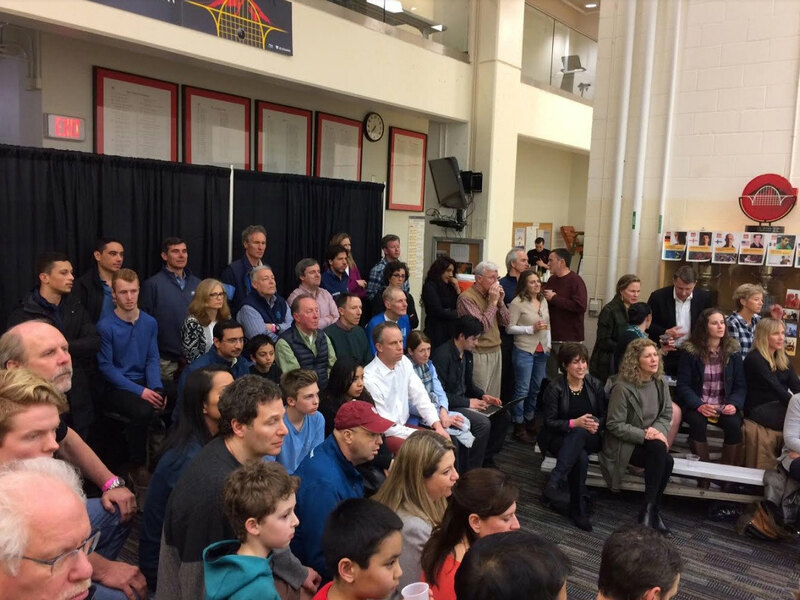 We had a packed crowd at the Multnomah Athletic Club for Saturday's final. The crowd was excited to support its American star, Todd Harrity, but his finish opponent Olli Touminen was ready to put up a fight. And he did. Todd started playing at a very fast pace and he took the first game comfortably. It seemed like Olli was tired from the previous night but in the second set, once again like he did for most of the tournament, he dug deep to hang in the rallies with Todd. Whenever it seemed that he was going to break, he would come up with amazing rallies and beautifully constructed rallies. Olli took the second game 15-13 and never looked back. Once he saw the opening he got more and more confident. 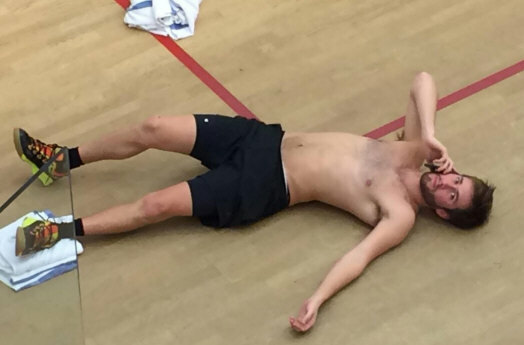 In the end Harrity didn't have an answer to Olli's precise play and the Finish champion took the Oregon Open 2017 final 8-11, 15-13, 11-7, 11-4. Ollie was gracious in victory and commented on his win: "Now a days it takes me a couple of games to actually get into the match. Same thing happened today. I was slow in the second but I managed to win tie-breaker which I was very happy about, of course, to get the games even. I kept on going and I saw that he was slowing down a little bit and I kept on going and managed to win. I hope I'll be back next year. "I want to thank everyone, all the sponsors without them this wouldn't exist. And all the families and billets who have take care of us the whole week. It's been fantastic. And of course the crowd has been amazing through out the week. It has been a fantastic stay for me and for all the players." 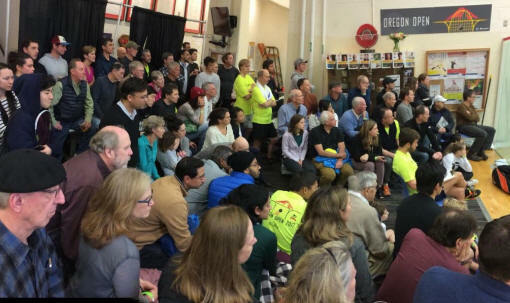 The Portland crowd was again entertained with the best Squash in the world. 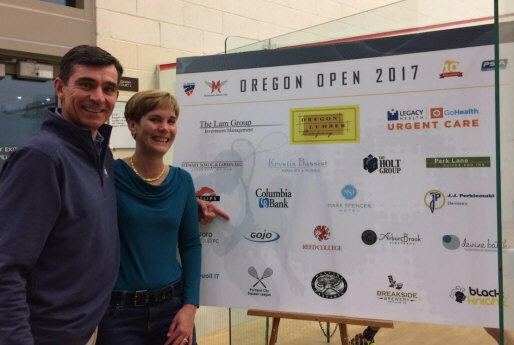 We hope to see all the players back here to put on a great show for the Portland Oregon Open 2018! Having fun in the Play-the-Pro handicap ! The first match of the night was an incredible battle between the explosive Kandra and the experienced Tuominen. 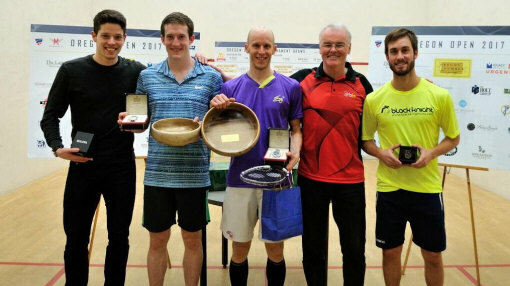 Raphael controlled the first game and was decisively controlling the T. It seemed liked it was going to be a quick match but Olli dug deep like the record breaking Finish National champion that he is and pulled off a fantastic comeback 7-11, 6-11, 11-8, 11-9, 11-9 . 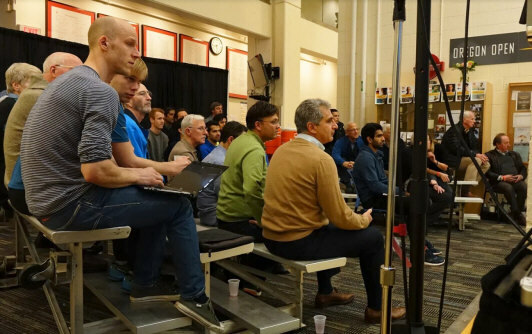 Olli was excited about his comeback and said the following after this match to the attentive Portland crowd: "He wasn't taken the ball that early and that let me back in the game. In the beginning I was bit too late in the ball. But then I started to get my own rhythm as well. "That momentum I managed to keep it going. Although it was a really close match I was able to keep that momentum until the end. It was a tough match and a lot of tough rallies. I'm really happy that I managed to push through." The second semifinal of the night was just as exciting. Leandro started strong, as he always does, and got the first game. But Todd was able to tighten up his shots and put Leandro under a lot of pressure. Todd explained the way he was feeling during the match: "I was not trying to think. I just played as the match went, because when I think too much, I just think too much and make bad decisions. It was a great match. He's had some really tough matches. "At the end I could tell he was tired. But to beat someone that has the shots and to stick to that game plan is a hard thing to do. I'm glad I was able to stay focused and be as precise as I could." The first quarter final saw the Finnish #1 and Finnish #2 battling for a place in the semis. Henrik started off attacking well and took an early lead in the first. It looked though Ollie was a bit stiff from his match last night, but after a few dynamic rallies he seemed to loosen up. Tight play from Tuominen coupled with a few unforced errors from Mustonen allowed the elder Finn back into the game which he eventually took 11-6. It was a similar story in the second and the third. Ollie's experience and structured play stifled Henrik's attacking game. Both players played a high tempo, but it was the 17-time Finnish national champion Tuominen who was more clinical in the end. 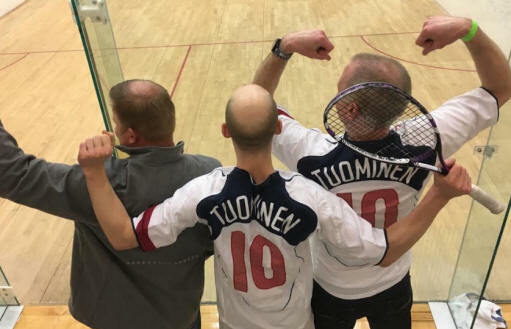 Match to Tuominen 11-6, 11-5, 11-8. Olli commented on his longevity in the game "I try to keep myself fit and practice. Obviously you can't give any lose balls to these guys or any possibilities to come back. That's my target. That's my plan when I play against them. 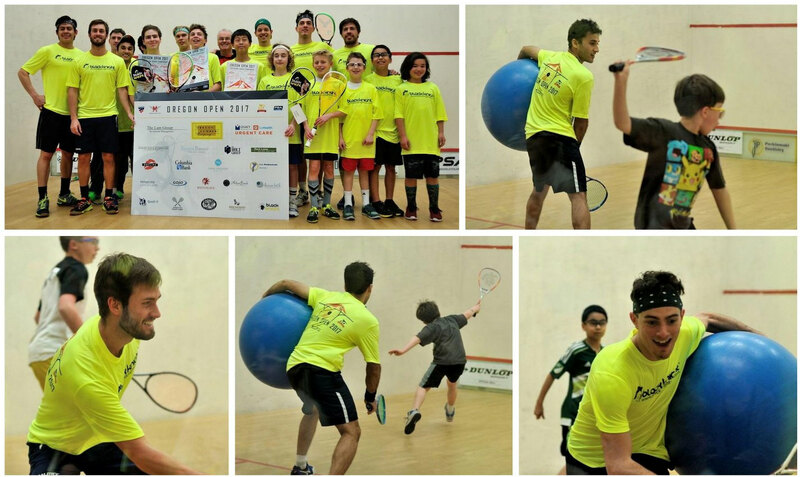 If I can keep myself fit I can still play a little bit of Squash." In our second quarterfinal, we saw the Indian shot-maker Vikram Malhotra against the strong #1 seed Raphael Kandra from Germany. Raphael showed no signs of fatigue in the first game after his 90-minute encounter with Iker Pajares the night before. It was Vikram who left the ball sitting up in the front where he was punished by Raphael's agility and speed onto the ball. A comfortable game to Raphael. After a sluggish start, Malhotra found his rhythm and accuracy in the second. With an array of audacious attacking volleys, Vikram leveled the match at 1-1. 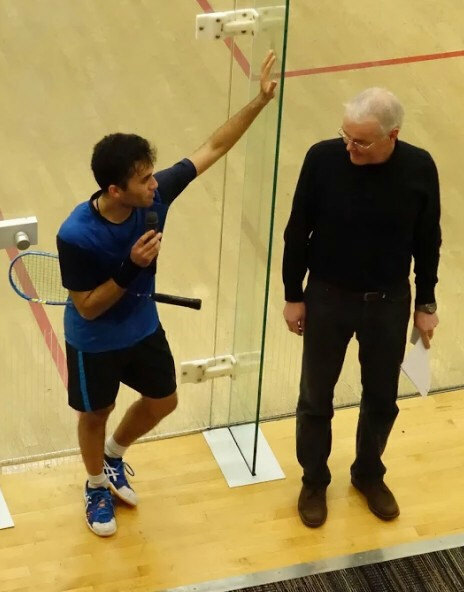 But the momentum swung back to Kandra once again and he was able to take the match 11-6, 7-11, 11-5, 11-9. Kandra remarked at the end of his match: "the first game I was very powerful, very strong. He didn't expect me to be that fresh. "But in the second he was very dangerous, he was counter attacking crosscourt nicks and I got a little too defensive. But then I tried to get back and focus as I did in the first one and it worked out." Arturo Started playing extremely well, controlling the T and the pace of the game. He won the first game and was 8-4 up in the second. 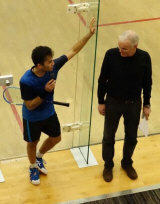 But he lost his focus and Todd took advantage of it and never looked back taking the match 6-11, 11-4, 11-8, 11-6. Told had this to say about the match in the post-match interview: "In the beginning I just felt he was shooting the lights out and picking me off and I really wasn't prepared and ready for all his attacking shots and good hands. "Tough start. But then I just tried to keep him in the back as much as possible. I actually hadn't beaten him before. I respect him." Leandro is officially the dark horse of the tournament and once again defeated a higher ranked opponent. A close match but Leandro was able to find more nicks and spectacular gets than Chris and he took the match 11-7, 11-6, 9-11, 11-4. The Argentinian was very kind to the Portland crowd and thanked them for their support: "Well thank you everyone for staying late to watch the matches. Congratulations to Chris, he's playing well. For me, I'm so happy to maintain this level. "Every match is tough. 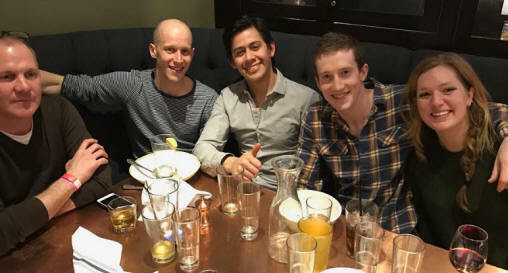 I'm trying to recover and to prepare for the next one.Todd is an incredible player. He is playing really good. Looking forward to tomorrow to have a good performance." The upset of the day. Leandro played unbelievably well. All his nicks were going in and he was getting to everything Joe Lee was throwing him. The three games were very close but Leandro's spirit and good touch today allowed him to progress. He's carrying great momentum from winning the Toronto Classic last Sunday and has played eight consecutive days without losing a match! 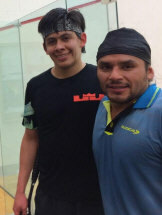 Leandro wins the match 11-9, 11-8, 11-7. 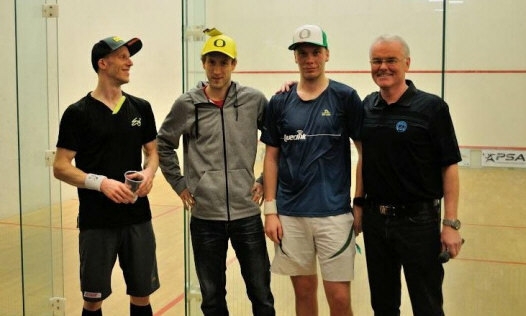 A mix of nationalities will be added to the Oregon Open main draw after qualifying final wins for Nick Sachvie (Canada), Shahjahan Khan (Usa), and weekend PSA winners Eric Galvez (Mexico) and Leandro Romiglio (Argentina. Romiglio beat local favourite Julian Illingworth, the 9-time US champion competing in his home town. 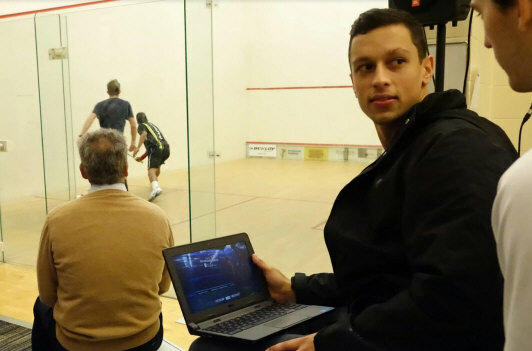 "I knew Julian had a tough match against Robertino yesterday so I tried to make the first two games tough. And then he came back with incredible shots in the third. "I told to myself 'let's run one more' and it worked for me. Congratulations to him, he still can play at a high level. It's my first time here and it's very beautiful. Lately I have started to play more tournaments in the States and Canada. I think that has given me more experience and rhythm and that's they key." Sachvie also beat an American player, Faraz Khan. "These days I'm playing all the North American tournaments, most of my tournaments are on the East Coast. I've been all around Canada the past two months. I haven't been to many American tournaments this year but I usually dabble and pop down here for a few. "There are so many events in North America these days that I haven't had to go anywhere across the globe at this moment. But the higher you move you want to play the bigger events, travel and play with the big guys. Hopefully in the future I will be everywhere." The sole home winner, Shahjahan Khan edged past Matias Tuomi in five games. "Portland is a nice city, beautiful. So everyone wants to come here. The players here are tough compared to other 15k tournaments. Every draw is tough. Everyone has come here to win." What a barn burner! Cunningham starts off hot forging an 8-2 lead in the first and Khan looking a tad nervous. Nonetheless the resilient Khan makes a determined comeback to force a tiebreaker and a few gut wrenching rallies later Shah walks out with the lead for a 12-10 win! From the get go of the second Shah looks like a different man and goes to variation town with some sublime flicks and holds and Cunnigham looks down and out 11-5. 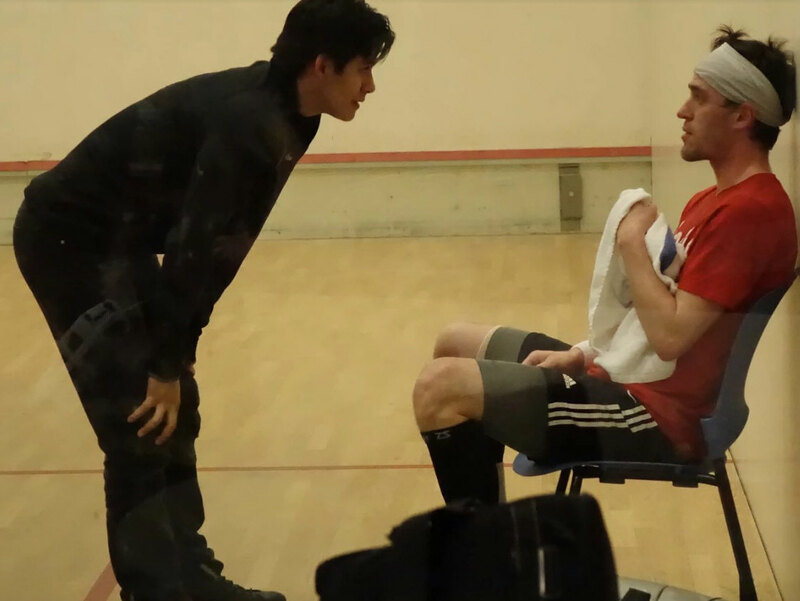 Fast forward a bit and Khan is up 10-7 in the third and somehow Dylan comebacks and steals the game and the crowd is bewildered as am I :) and again in the fourth deja vu Khan up 10-7 in the fourth only for Dylan to squeeze it 12-10!!! Fifth game Khan gets back to basics and picks up every ball imaginable leaving Dylan in shock and Khan walk away with an 11-4 win I. That was a tremendous match. Juan is just so skillfull and deceptive, and gets off to half a bagel with a 6-0 lead looking somewhat invincible but Romiglio sticks with it and captures the first 13-11 staving off three game balls, same story in the second with Leandro coming back again and with some tight play is up two games to nil with an 11-9 score. And finally the third ends at 11-7 in favor of the Argentinian who looks fit and determined! All around a great cordial match, looking forward to seeing more of the dangerous Argentinian later in this week. Two good buddies on tour finally met in their first ever PSA encounter which was bound to happen eventually, and a tightttt battle ensued. Khan's unorthodox play wore down Reuben a bit and if I must say Khan had a little good fortune to come out on top. Staying persistent throughout the match Khan weathered the storm of Phillips highly attacking and pristine short game to come out on top 3-1 this time. Mauricio put a good effort but the ball control and speed of the veteran Galvez proved too much. Galvez is running on a high from winning a tournament in Calgary, just yesterday, and looks to continue to keep the momentum going. All I can say about this match is BATTLE. 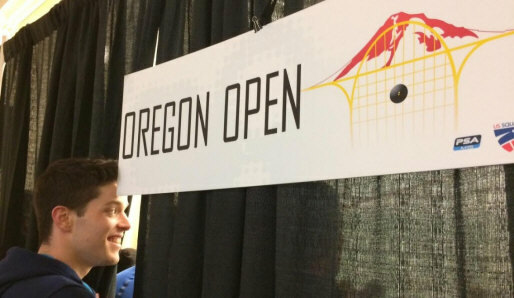 One for the ages here a must watch on the Oregon open youtube channel. Words don't do it justice really, but amazing pickups, flicks, dives, and heart in a classic encounter the crowd is sure not to forget for a long time. Watch it now online!! 3-2 Eddie, goodnight and tomorrow we go again.